Do you want to know the secret to building your business faster? Build your team!! It may seem counter-productive because you don’t have the money yet to invest in a team, but the fact is that without the team you can’t build the business the way it needs to be built. 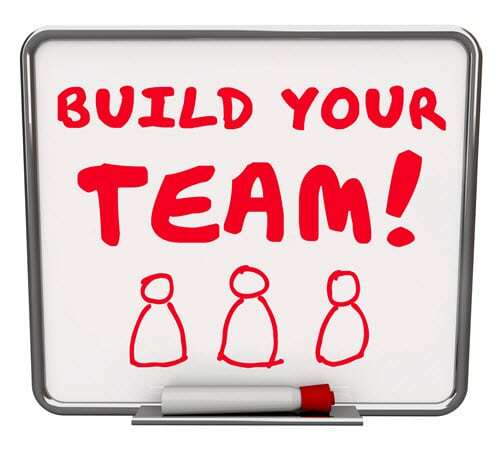 Building your team really does give you the ability to grow your business much faster than trying to do it on your own. This means that you have to learn to delegate, avoid perfectionism and focus on income-producing activities that only you can do. Today we will focus on who you should include in your perfect team. Build Your Team with Power Players! The odds are unless you went to college to get a business degree, you have had no formal training in running a business. I can tell you that it isn’t normally something you are born with. It is a learned skill. Trying to build a business without business knowledge is a dangerous slope. A business coach can help you avoid the pitfalls that kill so many businesses. Remember that a business coach should be ahead of you on the road, they should be close to or where you want to be. When I started Decisive Minds, even though I had already sold a company, I hired a business coach immediately because he could show me how to build a business using online components and I had never done that. Thank God for virtual assistants. You can hire assistants who will work from home to do everything from answer your phones, check your email, do your scheduling, create your web pages, customer relations, and marketing; the list goes on and on. How do you find a good one? You check references, hire them on a temporary basis and don’t be afraid to say it isn’t working out when it isn’t working out. Your numbers and your money are the life-line of your business. You need to have monthly or, at a minimum, quarterly reports calculated to show you the numbers for your business. You can also hire virtual bookkeepers and they aren’t as expensive as you might think. I know you might not normally think of a housekeeper as a business team member, but anything that takes you away from your business or gives you the ability to go into “avoidance mode” is dangerous to your business. Since the majority of entrepreneurs work from home, it is really easy to go clean the kitchen instead of making those sales calls. Food for thought! There are many other spots on a team that you could fill, but for someone who is trying to get to the 6 figure level, these are the ones I think are most important to start as you build your team.